Now that the dust has settled from the uproar caused by Jefferson Bethke's popular YouTube video, it is possible to collect the Catholic responses into one location. I think all of these commentators are converging around the same points, but it is still interesting to see the different angles of approach that people use. Plus, the more ammunition at your disposal the better. Bethke's philosophy of religion is nothing new. Catholics need to know how to respond to it. Here's what I've been able to find so far. Note that some of these articles don't explicitly mention Bethke or his video, but they still address the issues that Bethke has raised. If you find a link I should add, please leave a comment and let me know. Fr. Dwight Longenecker: Spiritual but not Religious? Matthew Warner: I Hate Religious People? Taylor Marshall: St. James vs. YouTube's "Why I Hate Religion"
Marcel LeJeune: Does Jesus Hate Religion? Should You? "Catholic Chris": Why I Love the Church - A Response to "Why I Hate Religion but Love Jesus"
Fr. Shane Johnson: Jesus > Religion? 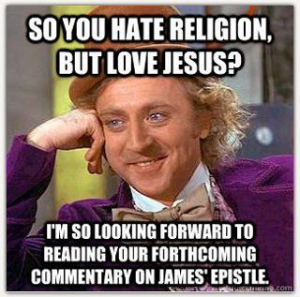 Owen Swain: Confession: I Am Not a "Follower of Jesus"
Joe Heschmeyer: Jesus v. Religion? "make a friar": "Why I Love Jesus but Hate Religion: A Catholic Response"
"defense4thefaith": A Response to "Why I Hate Religion but Love Jesus"
Fr. Robert Barron: Fr. Barron Comments on "Why I Hate Religion, But Love Jesus"
As a born-and-raised, tried-and-true Catholic, I can say that there are many, many sentiments Mr. Bethke shares in his video that I find myself in whole-hearted agreement with. As this is neither the time nor place to delve into each and every line of the poem (as PhatCatholic has done), I will address a few. Firstly, let me present the thought that there is absolutely no reason to split hairs over "false religion". We, whether as indivduals in our daily lives or as the Catholic Church as whole all know someone (or numerous someones) whose only practice of religion manifests itself in the aforementioned form. No one is a fan of said "religion"...let's agree on that fact. I agree. But I think it is also important to make the distinction between "true" and "false" religion. Bethke has not made this distinction, and his video suffers greatly as a result. If he was saying, "I hate hypocrisy" or "I hate self-righteousness" then that would be one thing. But, he has decided to make the more salacious statement "I hate religion" and to talk as if religion -- all religion -- is the embodiment of hypocrisy and self-righteousness. This is flat-out insulting and untrue. His statement is so bizarre I'm convinced that he really doesn't know what religion is at all. Now, to pinpoint a few notes from both the video and phatcatholic's response: Religions have started many wars. Period; done; over with. The Crusades are not something created out of a mad historians mind; they happened. I don't like it anymore than you do, but it happened. I absolutely agree that there are times when war is necessary, but's let's not mince words here. Mr. Bethke did not state that "religion has started all wars"; he said "[religion] has started so many wars". I never accused Bethke of saying that religion started all wars, so I'm not sure where this criticism of yours is coming from. Go back and read what I said again about religion and wars. My whole point is that you can't throw out religion because it has started wars. First of all, not all religions have started wars. Secondly, even the wars that have been waged in the name of religion have not all been bad or immoral. Thirdly, if Akin is right (and I think he's on to something) it's hardly ever as simple as "religion starts wars." There are always political and material aspirations involved as well ... oh, and sin. Bethke has taken a very complex topic and crudely oversimplified it so he can have another snide remark for his poem. I refuse to let him off the hook for that. Now, as Catholics, would we really let Jesus in to our church if he came? I mean really, really LET HIM IN. I love Catholicism, but I do not agree with everything that is taught. We "let Jesus into our Mass" in the Eucharist we receive (as mentioned in phatcatholic's response to this question), but if Jesus were just someone in off the street, we would not allow that individual to receive Communion; correct? Heck, we don't even allow someone who has attended mass his/her entire life but then went to college and began participating in a Christian service (or simply missed a few weeks of Mass or Confession) to receive communion, so we dang sure wouldn't allow a "new person", whether we knew he was Jesus or not, to partake. I think you're wrong about this. If someone presented himself for communion and the minister of Holy Communion had no reason to believe that the person was not disposed to receive the sacrament, then the presumption would be that the person could receive the Eucharist and so he would. At any rate, last time I checked, the status of one's living arrangement did not disqualify him to receive the Eucharist. The poor, especially those present at Mass, remind us to be hungry for the food that satisfies. They are always welcome in our churches. I don't know of any church that turns away poor people. Phatcatholic took the easy road out on this one and went with the de facto, "Oh yeah, we would let Jesus into our church. We already do; he's in the Body, Word, and Eucharist." This shows one of two avenues of thought to me: 1) phatcatholic has intentionally misinterpreted Bethke's question, or 2) he correctly interpreted it in his mind but then chose to skirt it on his blog. My answer was perfectly legitimate. The many ways in which Jesus is present in the Mass shows just how welcome He is there. People come to church with the intention of meeting Jesus there, receiving Him there. Surely this means that He is welcome among us! Maranatha! Come, Lord Jesus! Last, but not least, let me note this: There are many Catholic churches (and other churches, most assuredly) that are a "hospital for the broken", but...and let me be clear here...just because a hospital has a Waiting Room, that does not make it a "hospital". A church having pews and an altar does not make it a "church". It must be a place in which someone is paid attention to and helped. The broken know they are broken; that's why they're here...is the doctor in, or is he not? Are you questioning whether or not the Catholic Church is a hospital for the broken? I know that it takes more than some pews and an altar to make a church. It takes people, and we have plenty of them. These people come to the pews and the altar to celebrate the Mass because they receive grace there, and they realize how much they need the grace of God to persevere to eternal life. The Church is not a waiting room, it is a place to receive the healing and consolation that only the Great Physician can provide. My Church gives people that. Are you really denying that? If you don't know who Jefferson Bethke is by now, you're living in a cave. For the uninitiated, he's responsible for a YouTube video (with over 10 million views) that attempts to establish that Jesus came to abolish religion and that a relationship with Him is antithetical to religion. You can watch the video and read my response to it here. A few people have voiced objections to various parts of my response. I would like to respond to these objections. "Rob B" will be first. His words will be in bold. This segment alone [my words on religion starting wars] was enough to convince me that the author of the article was both logically limited, and/or purposefully rhetorically manipulative, and severely biased. Seriously? I'm surprised you had such a strong reaction to that part. Those are some bold charges you have made against me. Anyone want to guess how small a % of all Christians the Amish make up? The number of Amish people is irrelevant. Bethke said, "religion has started so many wars." My goal was to put things in perspective. Many religions have not started wars. This is an irrefutable fact, as evidenced by the Amish and other pacifist religions. Who feels like defending the crusades as just? There were certainly abuses that took place during the Crusades. No one denies that. But, the Crusades are also grossly misunderstood, and far from the atrocity that some people make them out to be. At any rate, I acknowledged in my original post that Catholics have not always conducted wars according to the Church's "Just War theory," but this is the fault of sin, not religion. He repeats the cliche that religion starts lots of wars, which is nonsense. Religion is a powerful motivator, and thus is often invoked in wartime, but the real reasons most wars have been fought have nothing to do with it. Instead, they have to do with political control–either allowing certain political leaders to gain or remain in power (e.g., who is the rightful heir to the throne) or they have to do with gaining political control of resources (e.g., land, money, food supplies, transportation and trade routes) or they have to do with a particular leader’s ambitions (i.e., being remembered as a great man, or not being remembered as a weak man). When leaders aren’t being totally naked about those things, they dress them up with national pride or religion, but ultimately they are not at the root. The reason political leaders invoke religion when going to war is that religion is a powerful motivator that is built into human nature, which is why religion appears in all human societies. It’s a human universal, and religion in that sense is not something Jesus came to abolish. He didn’t come to root the religious impulse out of mankind but to shape it and channel it properly (e.g., “Blessed are the peacemakers”). For the rest of Akin's response to Bethke, see "Why I Hate People Hating on Religion". There are wonderful people who practice all religions. That said, it's very important that religious organizations are criticized when criticism is warranted, and it is far too often. I believe Jeff's criticisms were intended to be directed at organized religion. It seems fairly clear from the context that this is the case. I agree. Bethke's beef is with organized religion. I'm confused as to why you think you and I are in disagreement on that point. Yet your first point, and the one which frames the entire article, assumes he is using the Catholic church's definition: "A set of beliefs and practices followed by those committed to the service and worship of God. The first commandment requires us to believe in God, to worship and serve him, as the first duty of the virtue of religion." What follows is a bit mindblowing to me, because Hinduism fits this definition. The definition also does not exclude people who may follow the same beliefs as most Catholics, but have determined different practices that they routinely engage in. So what's your point? I'm having trouble following you here. Hinduism is a religion as I have defined it. When Catholics reject Church teaching and follow their own whims they create a religion unto themselves. I agree. What's so "mindblowing" about that? Would you have the audacity to argue that the Catholic church has not, many times throughout history, excommunicated people and not accepted potential converts merely because those people refuse to follow specific practices included in its dogma? I don't really understand how this is relevant at all to the topic of my original post. I don't deny that the Church has excommunicated people. I think this is a good thing, but now is not the time to go down that rabbit hole. If I am not scrupulous to stay on topic, this debate could go in all sorts of directions. I would read the rest of this post, but I just don't see it as a productive use of my time. I gave you the time of day, perhaps you will extend to me the same courtesy? PS: Go here for Part 2. You can read the lyrics at rapgenius.com. I am very thankful for these lyrics because they save me from having to transcribe the video and they also give me the ability to represent him correctly and to address him thoroughly. UPDATE (3/6/12): His interview on Nightline provides some context. Thus, what follows is a line-by-line response to the video above. Bethke's words will be in bold. "What if I told you Jesus came to abolish religion"
"A set of beliefs and practices followed by those committed to the service and worship of God. The first commandment requires us to believe in God, to worship and serve him, as the first duty of the virtue of religion." I think this is a definition most religious people would agree with. To put it another way, one could say that religion provides the form to our relationship with God. When I decide that I love Jesus Christ and I want to hand my life over to Him and live for Him, this must be expressed and lived out in certain ways in order for it to be genuine. I can't just believe any old thing about Jesus, behave however I want, and worship Him however I feel like. There is a right and a wrong way to believe, and act, and worship. Religion establishes the right ways of doing these things so that I can give God the belief, worship, and service He deserves and requires from us. Once religion is understood in this way, Bethke's statements stand out in stark relief. To return to the statement at hand, in no way can it be said that Jesus came to abolish religion. He specifically said, "Think not that I have come to abolish the law and the prophets; I have come not to abolish them but to fulfill them" (Mt 5:17). The Law established the religion of the Jewish people, and Jesus came to fulfill it, to make it what it was meant to be, not to do away with it. These words of His are very peculiar for someone who supposedly came to abolish religion. This statement is a red herring, and it reveals more about the author then it does about religion. You're a Democrat, we get it. Let's try to stay on topic. First of all, this blanket statement assumes that all religions are the same: they all cause wars. While it is true that some religions have been responsible for wars, not all of them have. Has anyone been overthrown or put to the sword by the Amish recently? I didn't think so. Let's not throw the baby out with the bath water. Secondly, this statement also assumes that all wars are bad. This isn't true either. Sometimes, if you believe in something with all your heart, you have to fight for it. This is a good thing, if it means the defense of your life and your rights. For example, I don't think too many people argue that it was wrong of the Holy League, a coalition of Catholic maritime states from the 16th century, to go to war with the Ottoman Empire at the Battle of Lepanto to preserve the very existence of Christianity in the Mediterranean. Catholicism, for it's part, has a very ancient Just War theory that establishes when going to war is a legitimate enterprise. Did Catholics always abide by that? Of course not. But that is not the fault of religion, it is the result of sin. So, there are religions that are entirely pacifist (the Amish) and religions that teach it is permissible, even necessary, to go to war under certain conditions (Catholicism). There are also religions that are indeed war-mongering: Islam comes to mind. I can join Bethke in my aversion to that religion, but not to all religions as a general principle. It doesn't. At least, Catholicism doesn't. We have managed to do both for several hundred years now. The Catholic Church is the largest charitable organization in the world. I challenge anyone to find an organization that does more for the poor than the Church does. Also, building huge churches isn't a bad thing. Huge congregations need huge churches. Furthermore, the breadth and height of the great Catholic cathedrals and basilicas are meant to reflect what we believe about the liturgies that take place within them. The Mass in particular is the meeting point between the faithful on earth and the saints in heaven. The Mass is, in fact, heaven on earth, and so our church buildings, which are fundamentally for the celebration of the Mass, should reflect the glory and splendor of the heavenly liturgy. They rise up into the heavens to meet the angels and saints in their perpetual worship of the Lamb. So, yea, some of our churches are huge ... but some of them are not. Some of the most beautiful Catholic churches in the world are in fact little chapels tucked away in far-flung places, where communities give out of their poverty so that they can have a place of their own to worship and to pray. Religion isn't all about "building huge churches." It's about glorifying God however you are able. But in the old testament God actually calls religious people whores"
Mt 19:3-8 And Pharisees came up to him and tested him by asking, "Is it lawful to divorce one's wife for any cause?" 4 He answered, "Have you not read that he who made them from the beginning made them male and female, 5 and said, 'For this reason a man shall leave his father and mother and be joined to his wife, and the two shall become one flesh'? 6 So they are no longer two but one flesh. What therefore God has joined together, let not man put asunder." 7 They said to him, "Why then did Moses command one to give a certificate of divorce, and to put her away?" 8 He said to them, "For your hardness of heart Moses allowed you to divorce your wives, but from the beginning it was not so. I'm thinking more and more that when Bethke says "religion" he really means "the pharisees" or pharisaic people. The scribes and the pharisees ridiculed and punished many of God's holy prophets, and many irreligionists understand Jesus' many rebukes of the scribes and pharisees as a general rebuke of religion. But, the scribes and pharisees represent religion gone wrong, not authentic religion. They are the ones who "preach but do not practice" (Mt 23:3), who "bind heavy burdens" (vs. 4) and "do all their deeds to be seen by men" (vs. 5), who "shut the kingdom of heaven against men" (vs. 13), who are "blind fools" (vs. 17) who "strain out a gnat and swallow a camel" (vs. 24). They are the "hypocrites" and "whitewashed tombs" (vs. 27), not religion itself. Religion -- or at least, the religion established by Christ -- is meant to preserve us from that! Jesus, by preaching against those things, was establishing the nature of true religion, which is what Christians strive to follow today. At any rate, the scribes and pharisees did not ridicule John the Baptist. They asked him many questions, in order to determine who he was (cf. Jn 1:19-27), but I'm not sure this can be counted as ridicule. This again calls to mind what Jesus said to the pharisees in Mt 23. Religion is not like spraying perfume on a casket, or like whitewashing a tomb. Hypocrisy is. Religion is believing, and worshiping, and serving God rightly. This entire poem is largely the tearing down of a straw man. I realize that, for some people, religion becomes just a going through the motions. Mass on Sunday, no meat on Friday, sit, stand, kneel, repeat. But is it not also true that religion is for others a rousing experience of the Holy Spirit, a transformation from within by the power of God's grace? Has Bethke never meant anyone who truly loved being Catholic (or loved being a member of any religion, for that matter)? Surely he has. Why then does religion penetrate some people to the core, but is for others only a surface experience? This can be for many reasons. Sin certainly keeps a person from experiencing the movement of the Spirit through religion. It makes him rebel against the responsibilities of religion, and it darkens his mind to what is truly taking place in the practice of religion. Often religion comes alive for a person once that person realizes why he is doing what he is doing: why he stands at the beginning of Mass, why he kneels during the Eucharistic prayer, why he goes to Mass on Sunday, why he gives up meat on Friday, why he receives ashes on his forehead, why we light four candles during Advent, etc. The answer to this question is vital to the experience of religion. My overall point is this: religion is not without meaning or profound influence. It is up to us to open our hearts to the promptings of the Spirit and to discover for ourselves why we do what we do in the name of religion. When we do this, then religion becomes very much more than what Bethke is describing here. He acts like religion requires people to act fake and put on a show. But it doesn't. I don't know of any religion that does. If what you do in the practice of your religion is not a reflection of who you truly are as a person, then that's your fault. Don't blame your hypocrisy on my religion. I agree with Bethke that Christians need to provide an authentic witness to their faith. Religion should indeed be more than just an act or a show. Bethke realized his hypocritical ways, but instead of living his religion more authentically, he simply dispensed with religion so that those pesky things that made him look bad would no longer be required of him. "Knowing Jesus" means following these commands, which are at the very heart of the Christian religion and what it means to be "religious." He's right: it should be ... and it is. This is how the Catholic Church understands herself. Nothing new here. Amen. Well said. We "slaves to religion" certainly share with Bethke an experience of the love of Christ eradicating sin and shame. When Bethke says such things, I am convinced he really has no idea what religion is. You know it! We let Him in every day the Mass is celebrated. He is in the members of the Body gathered together. He is in the person of the priest. He is in the Word proclaimed. He is, really and substantially, in the Eucharist we receive. Jesus Christ is very much at home in my religion! First of all, getting rid of all religion because there are some bad religious men makes about as much sense as getting rid of the police force because there are some bad cops, or getting rid of the presidency because there have been some bad presidents. Like I said before, let's not throw the baby out with the bath water. Furthermore, there may be some religions that believe one can achieve righteousness solely through one's own effort, but the Christian religion has always been against that sort of thing. This is again more tearing down of a strawman. Hopefully you're beginning to see by now how silly this statement is. Jesus Himself was a very religious person. He was circumcized. He was baptized. He celebrated the Passover and the other Jewish feast days. He worshipped in the synagogue. He followed the Ten Commandments. He prayed. He fasted. He went on pilgrimages. He is the fulfillment of the Jewish religion and the very creater of the Christian one. Yes, a religion -- not some warm and fuzzy "me and Jesus" experience, but a religion, a church, with bishops, priests, and deacons, and commands to follow, and things to do, and words to live by. It only takes a cursory glance at the New Testament to realize this. Earlier Bethke said he loved the bible. I'm beginning to wonder how much of it he has actually read. I wonder what Bethke thinks of baptism. I'd imagine he considers it, like all the sacraments, to be just more trappings of man-made religion, more "do" and less "done." Well, the thing is, Jesus Himself instituted the sacrament of baptism (Mk 16:16; Jn 3:3-5), and gave the apostles, as His last will and testament to them, the command to go and make disciples of all nations by baptizing them (Mt 28:19). And guess what else? That's how I became God's son -- through baptism, through the function of my religion. Not a slave, a son, a free man, with eyes enlightened by the grace of God. Bethke's words here are borderline insulting to me. Who's really doing the "ridiculing" here? Wait, now I'm confused. I thought Christianity was the problem. It is a religion after all. Bethke needs to supplement his video with a glossary of terms. That would aid tremendously the discussion that he has begun. And while being murdered he yelled, "Father forgive them they know not what they do." Yes, He meant it, that much we can agree on. PS: Also see "In Defense of My Response to Jefferson Bethke: Part 1 and Part 2"
Does the one-hour fast before receiving Communion include water? Who is the “woman” spoken of in Rev. 17? This is a difficult question to answer, and for two reasons. First of all, it is often the case that characters in the Book of Revelation symbolize more than one reality. What this means is that there can be more than one answer to the question of who the woman is. Secondly, scholars continue to debate the identity of the woman. We don’t have the general consensus, even among Catholic scholars, that one typically finds with other passages or books of the Bible. Modern Catholic biblical scholarship seems to be converging on the understanding that the woman (also called a “harlot”) represents the city of Jerusalem. This is the opinion of several popular Catholic authors and theologians, including Scott Hahn, Mark Shea, Jimmy Akin, Michael Barber, and Brant Pitre. However, there are still other Catholic scholars who think that the woman is pagan Rome, or both Rome and Jerusalem, or Satan, or any force against true religion. In my opinion, since some of the facts from Rev. 17 fit Jerusalem, while others fit Rome, it seems safer to say that the woman represents both cities at the same time. What every Catholic scholar can agree with is this: the woman is not the Catholic Church, as many fundamentalist Protestants would have you believe. For more on the woman from Rev 17 (and the beast, for that matter), see my blog post: "The Catholic Church Is NOT the Whore of Babylon". When do we celebrate the Flight into Egypt in Mass? We actually just did! On Dec. 28, the Feast of the Holy Innocents, the Gospel reading in the Mass was Mt 2:13-18, which is the account of the flight into Egypt, when the Holy Family fled to Egypt in order to avoid the wrath of Herod, who ordered that all boys two-years old and younger be killed because he heard that the King of Kings and Lord of Lords had finally come into the world and Herod was anxious to protect his own reign. In Psa 39:12-13, are the words "foreigner" and "refugee" used to imply being away from sin? Also, why is the Lord asked to turn His gaze so that David's smile may take place? 39:12-13. In line with what he has said already, the psalmist ends his prayer by beseeching God to listen to him and not to be too hard on him ("Look away from me": vs. 13). Expressions like "thy passing guest" and "sojourner" (vs. 12) indicate that the psalmist sees his life as being under God's protection, the way the Law protected foreigners resident in Israel, and wayfarers (cf. Ex 12:48-49; Deut 10:18-19; etc.). "Beloved, I beseech you as aliens and exiles to abstain from the passions of the flesh that wage war against your soul. Maintain good conduct among the Gentiles, so that in case they speak against you as wrongdoers, they may see your good deeds and glorify God on the day of visitation" (1 Pet 2:11-12). These terms also remind the Christian of the urgency of leading a life of union with Christ: "You do not have a permanent home here. Wherever you may find yourself, you will be a foreigner and a pilgrim; you will never find rest unless you unite yourself intimately to Christ" (Thomas a Kempis, De imitatione Christi, 2, 1, 6). 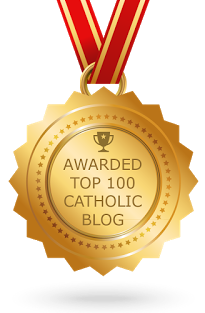 Could you explain CCC 99 to me, considering that there are many claiming the name "Catholic" while clearly contradicting the Faith? This section does have bearing upon the issue you have raised. Many Catholics who are not of one mind with the Church attempt to validate their contradictory views by saying that these views came about by the legitimate use of their conscience, or by their own feeling of being led by the Spirit, or by their adoption of what they think "most Catholics" believe or practice. We must inform such people that one's conscience must be properly formed by the teaching of the Church in order for it to lead a person to the truth, that the Spirit does not contradict itself and so will never "inspire" someone to hold a position contrary to Church teaching, and that the sensus fidei is not the zeitgeist, or popular movement of the times but what the Church has always believed and professed. In so doing, we ensure that people are better able "to welcome, to penetrate more deeply and to live more fully from the gift of divine Revelation."